theFoodette & Family: Food for Fuel- Cauliflower edition. Food for Fuel- Cauliflower edition. Hands up, who loves Cauliflower? Me too. Cooked, raw, dipped, naked, doesn't matter. Love it. I was reading a blog the other day and the author asked her audience if anyone knew the difference in the different colored cauliflowers. I did know, so I answered, and was then called a "veggie genius" LOL While I'm far from a veggie genius, I was very flattered. It did get me thinking, however, about doing a post just on cauliflower...and then maybe spotlighting some other vegetables and how nutritious they are! So here's the first post of what may become a regular thing here, let me know if you learn anything new! Cauliflower is part of the cabbage family. It's name is latin for "cabbage" and "flower". Though most people don't, the entire head of cauliflower can be ingested. Yep, stalks and all. Most people, however, only eat the "flower" part of the cabbage and use the leafy green part for vegetable broth or toss it away with the thick white stalk of the cauliflower. There are four major groups of Cauliflower, the most common that we see is the Italian- this type is the ancestral form from which the others were derived. 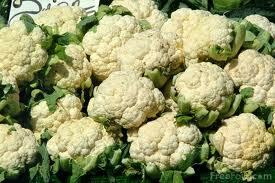 White cauliflower is the most commonly seen, though it does grow in many shades. So what's the difference? Vitamins, my friend. Orange cauliflower contains 25times more Vitamin A than white varieties (like pumpkin!). Purple cauliflower is purple because of the presence of antioxidents- the same antioxidants found in red cabbage and wine (word). Green cauliflower, or broccoflower, is higher in protein than other varieties. Cauliflower is low in fat, calories and carbs. It is also high in dietary fiber, folate and Vitamin K & Vitamin C. (77% of your dv of Vitamin C, people!) Cauliflower is an excellent choice for people following a low carb diet but still want the taste and feel of a potato dish- they have a similar texture without all the starches! As an excellent source of Vitamin K and a good source of omega-3 fatty acids in the form of ALA (alpha-linolenic acid) cauliflower gives us significant anti-inflammatory nutrients which are being studied in the fight against cancer and chronic diseases. So go! Eat your cauliflower! Just please don't boil it, it begins to lose all those wonderful nutrients! i love learning about his stuff! I'm excited for you to spotlight different veggies! and you are a veggie genius!